Can Private Investigators be Trusted in Personal Matter Investigation? The Private Investigators are legal professionals that perform the prime task of information gathering. They are trained individuals that can engage in 24X7 active surveillance. They have the paramount understanding of law and judicial system, i.e. what is permitted under the jurisdiction of law and what not. Hence, in case you are feeling yourself trapped in some unfortunate situation and cannot find a legal escape, then it is better to submit your case in hands of Private Detective Agency to look for substantial proof for you. 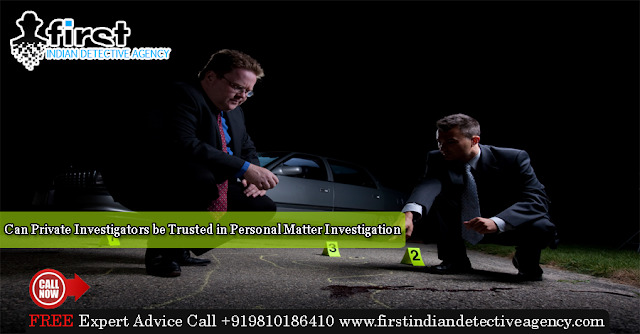 Why You can Trust First Indian Detective Agency? Many times, people often go for divorce cases without any substantial proof of infidelity against their partner. Hence, their court case stands weak in judgment of law. However, if you hire a private investigator they can help you minimize the risk of information coming out during legal course of action. When you have the proofs against your spouse it will only help you in court case. Hence, it is very beneficial to have a third part working in your favour. They can be your back in call for legal advice. Hence, your matter will be less biased and more credible. When people visit First Indian Investigation Agency's office with their problems like divorce, child custody, alimony, etc., Our clients are mostly worried and anxious for matter to be investigated. This is because they don't have the proof of the wrong doing against them. As soon as we explain our process of investigation process, a ray of hope is seen on their faces. While our team of investigators leave no stone unturned to work 24X7 to make of clients feel worry less. Private Detective agencies are supremely expert at gathering facts and figures about the matter being investigated. At times, people also try to investigate matter on their own, but in this process they at times prove themselves more culprit of the situation. When a wife takes a charge of spying on the activities of the husband it only makes her husband that he is on surveillance. It is special advice for such wives especially from team FIDA "It is better to leave the matter related to professional investigation in hands of experts." This is because you spouse may get instinction that they are being noticed. Ultimately they have to discontinue looking for evidences. This may leave you upset that nothing got unfolded in the complete endeavour. Many times people also waste ample amount of time in investigating themselves. But, ultimately no results since normally people lack investigation skills and right tools necessary to find out the truth. So whenever in doubt get in touch with the most renowned Detective Agency of Gurgaon. They are expert in handling all types of personal to corporate investigation cases.